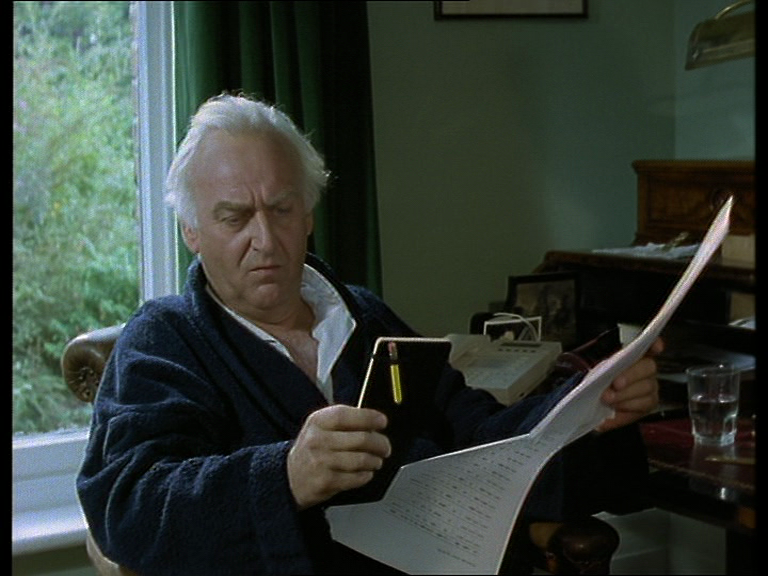 In the process of thinking through how Morse’s domestic space is presented across the course of four series, I have been struck by particular consistencies of how Inspector Morse is presented in his home, specifically the number of times he appears in his pyjamas and dressing gown. As I suggested in the CST blog, during the course of the series run (ITV, 1987-1993) the space of Morse’s sitting room becomes the site of both work and relaxation. 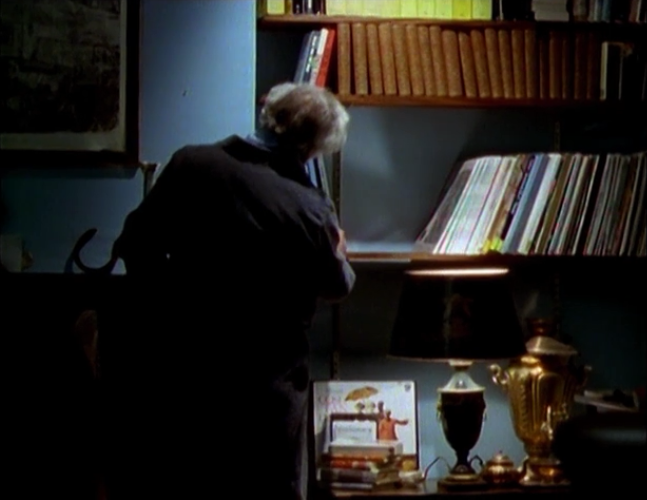 Moreover, the prominence of experiencing his home as a lived-in space – seeing Morse at home discussing a case with Lewis or not working and enjoying his domestic space – works to define the character (doing the crossword, drinking beer and listening to opera) and at the same time seems unusual for a programme where some of the generic tensions between work and relationships are not present. In this context, the decision to present Morse in his pyjamas is not only a striking one for the way it contributes to character development, but also for how it speaks to the ways in which the qualities of a particular space might be communicated and nuanced through costuming. At first the recurrence of a pyjama-ed Morse stuck out to me as a slightly odd way to encounter the character. Although it doesn’t not make sense to see him in his pyjamas, though we never see him in his bedroom, it also feels oddly overly familiar. This may be due to my own ambivalence towards the character of Morse; I feel as though I don’t want / need to see him in such informal circumstances (chiming with my slight squeamishness of his efforts to flirt with various women through the course of the programme). This feeling is compounded by his propensity for wearing suits (even three piece suits) while working. The pyjamas confuse my sense of him as a professional figure, and by extension the generic investment of the programme in the work of detection. 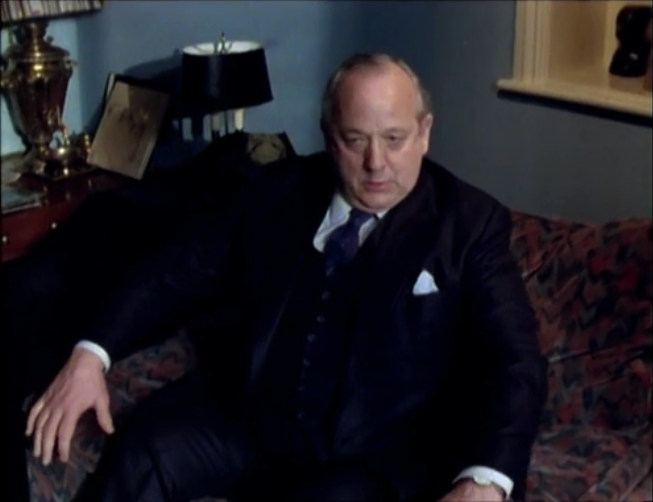 This particular costume choice, and its repetition, therefore operates as indicator that Inspector Morse as a series has interests beyond the professional (something which is indicated certainly at the narrative level by his interactions with women, especially the pathologist Doctor Grayling Russell with whom he has a developing not quite romance). 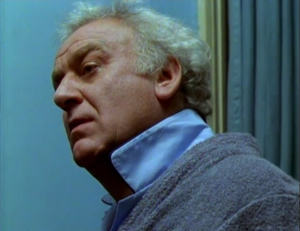 The depiction of Morse in his pyjamas (and relaxing at home more generally) invites us to consider him as a man and not just a detective, perhaps even to make us to understand certain realities in his make-up (we wear pyjamas, and so does he). Drawing on this basis, I’m especially interested in how this particular costume choice contributes to / inflects / develops the depiction of Morse at home, and therefore how costume and space interact. Through the course of seven series (28 episodes) we repeatedly encounter Morse in his home. The regularity of this access means that we become familiar with certain spaces – principally his sitting room, where he is most commonly situated. The furnishings and decoration featured in this room are remarkably consistent during these six years (though having just watched it all I have enjoyed spotting the slightest change of décor or wall colour or movement of furniture), enabling us to become accustomed with the qualities of the space even through we don’t always see it in detail. Indeed, it is rare to see the whole of the room in any one scene, the frequency of staging action in close-up or medium shot surely in part due to the practicalities of shooting on location rather than in a studio. 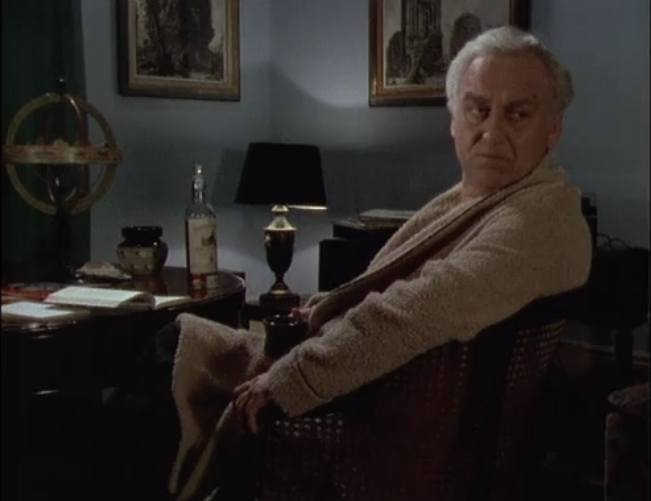 The room features a fairly worn looking sofa and matching armchair, heavy velvety curtains, some restrained antique wooden furniture (including a desk, chairs, table and earlier on a bookcase with a glass front) and various lamps. As a result, the space is made comfortable and welcoming through decisions about the soft textures of décor and muted tones provided by wood and colour detail. These qualities are further nuanced by the lighting, which ranges from gloomy and softening to stark contrasts of dark and light in the brightness of daylight. The room is decorated with props that further communicate character information and lifestyle – numerous books and records, along with a chess set and various prints and pictures hanging on the wall. As we might expect then, decorative and prop details go some way to communicate Morse’s interest in tradition (the fact that it never changes) and his taste for the finer things in life (well-made and unfashionable items). The space is not cluttered, but contains enough objects and details of design to be plausible as an everyday room. Beyond this, the sitting room is comfortably soft and has the appearance of being slightly worn, resulting in a lived-in feel. The surfaces are welcoming – the combination of plush (sofa, curtains) and natural (wood) softening any possible hard edges. This is a tasteful but not formal room, encouraging its inhabitants to recline, and to think and listen to music – we might consider the lack of a television or radio, an invitation towards contemplation (reading, talking and so on). sort that almost resemble a suit (no dark colours or pinstripes here), rather they are a light shade of blue and rather creased (consistent with him having got out of bed). For this reason, the towelling robe and crumpled pyjamas add to the tension, and further align Morse himself with the softened qualities of the sitting room more generally – in this costume he matches the interior more readily than Strange, and appears very much at home in his own space. The placement of this in the first episode immediately tempers his more abrasive qualities – his impatience with the bit of police work which opens the episode, for example – and the possible snobbery implied by his high-brow tastes. In this sense, the pyjamas work to modulate the character, giving him complexity, softening his harder edges. As the series progresses, the equation of pyjamas and vulnerability and comfort continues. It is a mark of Morse’s ease with Lewis, who becomes a regular fixture at his home at all hours of the day or night, that he frequently conducts conversations with his sergeant about work while wearing pyjamas. Indeed, it might be possible to see this as a mark of Morse’s actual appreciation and softer feelings for Lewis, to whom he is frequently most brusque and unpleasant. 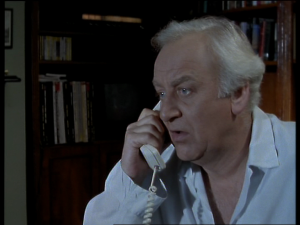 One of the rare occasions when he praises Lewis’ police work, in ‘Absolute Conviction’ (6.4), takes place while at home in his pyjamas and dressing gown. In Lyn Thomas’ article exploring the potential for a feminist reading of Inspector Morse she identifies Morse as representing an ‘idealized masculinity ‘ (1995: 8). I have to admit to being somewhat mystified by this reading of the character at first – he seems such a bullying snob (particularly his treatment of Lewis, which at times I find fairly intolerable). For Thomas the character incorporates the sensitivity associated with new ideals of masculinity and tradition: ‘Perhaps it is the combination of the traditionally paternal qualities described above with an ability to nurture which makes Morse blessed among men’ (1995: 9). The key to Morse is his vulnerability, a quality which is identified by Thomas in his dealings with women (his propensity for romance, and for gestures of emotion) and the sensitivity he displays in his responses to crime. Thomas situates this as central to the character in a way that indicates a generic shaping, a distinction from other detectives: ‘Morse, like the operas he immerses himself in, is a vehicle for the expression of grand emotion. Unlike other male detectives, or for that matter the Morse of the Dexter novels, emotion rather than intellect is his true medium’ (1995: 9). Looking to the qualities of the pyjamas and the ways in which they tie him to the slightly worn and comfortable sitting room I see support for Thomas’ assessment of the character. The series can be seen to make the most of this connection, employing this costuming in the staging of moments where he can be seen to be most vulnerable, or his emotional response to a case is at its greatest: in ‘In Service of All the Dead’ (1.3) while fretting over the woman to whom he has become attracted to (hopelessly, as it turns out she is involved with the killer) and in ‘Cherubim and Seraphim’ (6.5) when he is informed of his niece’s suicide. 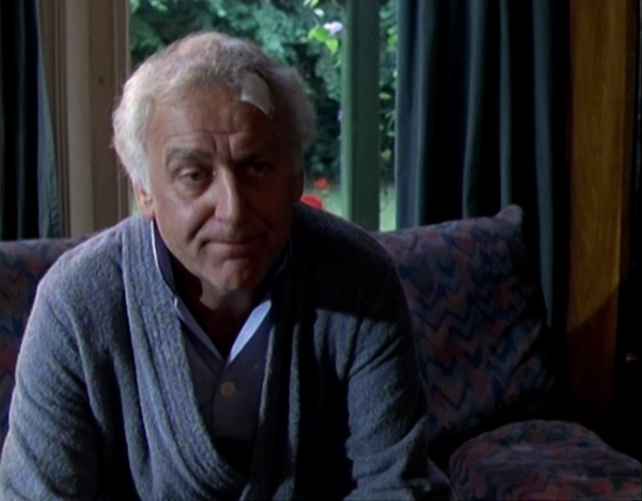 on his attitude towards his daughter and her music, but the fact that it is articulated through a scene in which he is wearing pyjamas indicates a degree of coherence with previous decisions about how to present or package the vulnerability and emotional qualities of Morse. Coming back to how this costume might contribute to the rendering of space, it is worth noting that the details of space (one that we have only encountered in this episode) are not developed, and our sense of the qualities of this particular domestic space are communicated through Lewis and his movement through it. 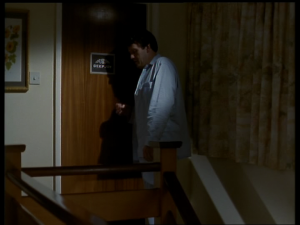 While the darkness of the hallway – and his exposed skin – could function as ominous, in both the generic and narrative context, I would suggest that Lewis’ costume here serves to qualify his concern for his daughter and the fostering of communication between parent and child. 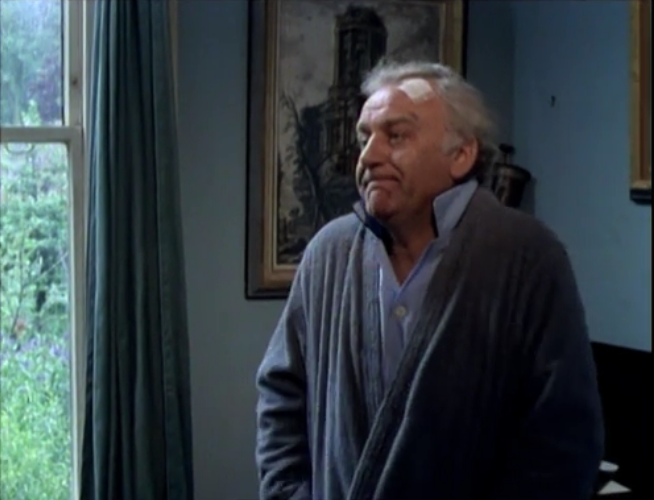 In this sense, the hallway – previous subject to loud music and shouting – has become a more positive domestic space, highlighted by Lewis’ increased sensitivity which is expressed by his costuming. Leading on the from the development of this pattern across the course of this one programme, I’m left wondering how typical it is to see policemen in their pyjamas, the different kinds of articulations of masculinity this costume might bring and in particular how it might shape the domestic space. If anyone has any examples to share, please do so in the comments. Thomas, Lyn (1995), ‘In Love with Inspector Morse: Feminist Subculture and Quality Television’, Feminist Review, 51, pp. 1-25. This entry was posted in Series and tagged costume, Inspector Morse, masculinity, pyjamas. Bookmark the permalink. not seen, but read – does this count? Ian Rankin’s Malcom Fox, in The Complaints, after being beaten up by a couple of fellow policemen, appears in pyjamas and dressing gown for at least 24 hours of the story, though he is normally more likely to be crashing on his sofa late at night in shirt trousers and braces. Interesting, particularly as an example of a break in the usual pattern. Certainly ties in with representations of vulnerability then too. Thank you!